Now let us read together from Mark's gospel chapter 10, and we're beginning to read at verse 46 - and this is the great miracle of the healing of blind Bartimaeus. Mark chapter 10, beginning to read at verse 46: "Now they came to Jericho. As He", that is, the Lord Jesus, "went out of Jericho with His disciples and a great multitude, blind Bartimaeus, the son of Timaeus, sat by the road begging. And when he heard that it was Jesus of Nazareth, he began to cry out and say, 'Jesus, Son of David, have mercy on me!'. Then many warned him to be quiet; but he cried out all the more, 'Son of David, have mercy on me!'. So Jesus stood still and commanded him to be called. Then they called the blind man, saying to him, 'Be of good cheer. Rise, He is calling you'. And throwing aside his garment, he rose and came to Jesus. So Jesus answered and said to him, 'What do you want Me to do for you?' The blind man said to Him, 'Rabboni, that I may receive my sight'. Then Jesus said to him, 'Go your way; your faith has made you well'. And immediately he received his sight and followed Jesus on the road". The point at which we have read from Mark's gospel is the place where the Lord Jesus is now nearing the end of the road, literally and metaphorically speaking. He is 15 miles from the city of Jerusalem. He's on His way, of course, to the celebration of the Passover feast - but we know, and of course Mark is the gospel of the cross, that the Lord Jesus is going to die for our sins. He's going to Jerusalem to be crucified. Now there's an apparent discrepancy in the gospel records regarding this account, because Mark and Matthew state that this healing took place as Jesus was leaving Jericho, and Luke's gospel says that the healing of blind Bartimaeus took place as the Lord was entering the city. Now there is, it would seem, a very obvious explanation of this: Mark and Matthew may well be referring to the ancient walled city of Jericho just north of the New Testament city of Jericho, while Luke in his record is probably referring to the New Testament Jericho alone. One thing is certain: beggars were a common occurrence, and a well-known sight on this Jericho Road to Jerusalem. Another apparent difference between this account and Luke's account and that of Matthew's - in Matthew 20 verse 30 he records that there were two blind beggars sitting by the Jericho Road, and one of them was named Bartimaeus. Now it would appear that both Luke and Mark focus attention on Bartimaeus because he was the more vocal of the two blind beggars. Indeed it is probable, and many scholars believe, that Bartimaeus, 'son of Timaeus' in Aramaic, was known later in the church, perhaps even a stalwart of the early church in Jerusalem. Now there are many many lessons that we can learn from the healing of blind Bartimaeus - for instance, just to begin with, there are so many gospel and evangelistic lessons that this story teaches us. I remember preaching the gospel from it under the heading 'Humanity's Blind Spokesman' - and he's a great picture of the awful darkness that humankind in their depravity find themselves. His pitiful condition, and how he is blind, and how the sinner is blind - 2 Corinthians 4 and verse 4 tells us that the god of this world, Satan, has blinded the minds of those who believe not. But not only is he blind, he's a beggar, and what a picture of the poverty of humanity - they find themselves so poor because they have been robbed by the thief, the devil, in their sinfulness. His pitiful condition speaks of humanity, his great opportunity speaks of humanity, but his earnest prayer speaks to us of our disposition, the way it ought to be, when we consider Christ. He was informed about Jesus, we see this from his cry: 'Jesus, Son of David'. He knew the Messianic promises, and he knew the Lord Jesus had fulfilled them. He was urgent in his earnest prayer, he cried out: 'Have mercy upon me!'. He was determined in his earnest prayer, twice he cried out. In fact, when people tried to silence him he cried out all the more! His prayer was an essential prayer for mercy, he knew that he had no hope in and of himself to be right before God - he couldn't earn God's forgiveness, he needed mercy as a great sinner. It was a personal prayer, he said: 'Have mercy on me', have mercy on me. I wonder do you understand who Jesus Christ is? I wonder are you urgent in your desire for salvation? I wonder are you determined to get beyond the crowd, and even those who would silence you, that you would get by them and cry out for mercy? You know it's mercy you need, you're not able to earn your salvation, you're not able to be acceptable with God - and do you understand that this is a personal thing of repentance and faith in Jesus Christ? Nobody else can do it for you, and you can't get to God in a crowd or in an organisation, it must be by personal repentance and faith. I wonder do you understand who Jesus Christ is? I wonder are you urgent in your desire for salvation? We see his pitiful condition, his great opportunity as Jesus passed by, his earnest prayer, and then we see fourthly the Lord's instant response to Bartimaeus. This is a great picture of how, in the gospel, the Lord Jesus is so ready, willing and able to hear our cry of repentant faith. It says that Jesus stopped - isn't this remarkable? In fact, the other gospel record says: 'He had compassion upon him'. The Lord Jesus now is going to do His great life work, which would be His death work, and the great work of all time and indeed eternity, the work that would be the means of this whole universe being redeemed and many souls being saved. Yet He had time to stop at the roadside on the way to the cross for this blind beggar. He wasn't too busy for old Bartimaeus. Not only did He stop, He called him. You know, it's wonderful to know that the call goes out in the gospel: 'Whosoever will may come'. Isn't it wonderful that the Lord Jesus listened to blind Bartimaeus. He cried out: 'Son of David, have mercy on me! ', and in verse 51 we read that the Lord Jesus answered and said to him, 'What do you want me to do for you?'. Praise God, not only did He stop, and call, and listen to blind Bartimaeus, He healed him! And fifthly we see the miraculous transformation in Bartimaeus' life - and this is the miraculous transformation that can come into any pitiful, blind, beggarly sinner. If they realise the great opportunity that there is for them in the gospel as Jesus passes them by, and they cry out, like Bartimaeus, in an earnest prayer: 'Lord, be merciful to me' - the Lord will instantly respond to them, their repentant faith, and there will be a miraculous transformation just as there was for Bartimaeus! It says that 'He received his sight' - but more than that, his faith had made him whole and well. Can you imagine what it was like for Bartimaeus? The first sight he saw was the Son of God! I can tell you, that was love at first sight. We know that he fell in love with the Master, because he followed Him. In John 10 verse 27 Jesus said: 'My sheep hear My voice, and I know them, and they follow Me'. I wonder is there someone listening to me today, and you're not a Christian, you're not born again, you've never repented of your sins and believed the gospel - you're unconverted. Do you realise the pitiful condition you're in? But do you realise the great opportunity that there is for you in Christ and in His gospel of free grace? Would you pray out like Bartimaeus, 'Be merciful to me', and know an instant response from Christ, and a miraculous transformation in your life as you receive your spiritual sight? But I warn you today: don't be making the mistake of thinking, 'Well, I may have another opportunity' - because if Bartimaeus had waited for another opportunity, his opportunity would never have come, because Jesus would never have returned by that road again, because Jesus was going to the cross. In the days before modern harbours, a ship out in the sea had to wait for the flood tide to come in before it could make it to the port. The term for that situation in the Latin language was 'Ob Portu', that is 'a ship standing over against the port', that's what that statement means - waiting for the moment when it could ride the turn of the tide to the harbour. We get our English word 'opportunity' from that Latin term 'Ob Portu', of the ship waiting against the port for the rising tide. The captain and the crew were ready and waiting for that one moment, that opportunity, for they knew if they missed the high tide they would wait for another tide to come, and it might be a long time. But my friend: you may never have another tide, you may never have another crest of the wave of the Spirit's moving, of the Spirit's conviction, of the Spirit's convincing of Christ and His righteousness and His salvation - so I urge you to come to Jesus now, just now. Do you know, there are very very pertinent lessons in this healing of blind Bartimaeus not just for unconverted people, but for the Christian. I feel that this is the main message as it's found here in Mark's gospel, and many of the thoughts that I'm going to bring out here I haven't found in any other commentaries. At times that ought to worry us, but I feel, having studied this whole book so far for so long now, and understanding, I believe, by the Holy Spirit's instruction, the main themes and messages and spiritual truths that the Holy Spirit through Mark is wanting to bring to us, I believe that there is a real message to the disciples here of the Lord Jesus, and to us as Christians - those trying by the power of the Spirit to follow Him in these days. Now this was the last miracle in Mark's gospel, on the last journey of Jesus to Jerusalem - but the significance about it, I believe, is that it involves blindness. We have already noticed in these studies in Mark's gospel the disciples' blindness concerning the message of this Gospel of Mark, that is: the way of the cross that Messiah must go, the suffering Servant that He would be, and the suffering service that is required of those who would be His servants and would be His disciples. Even in this chapter, of course, in verse 32, for the third time, the Lord Jesus predicts His death and resurrection to the disciples. He has already impressed upon them how they ought to serve one another, and that the greatest among them would be the one that serves - verse 44: 'Whoever of you desires to be first shall be slave of all. For even the Son of Man did not come to be served, but to serve, and to give His life a ransom for many'. Now, please note as well that Bartimaeus, in this account, addressed the Lord Jesus as 'the Son of David' - now is it not ironic that the nation of Israel was blind to the presence of their Messiah with them at this moment, and yet here is a blind beggar Jew who had true spiritual sight when the majority of the nation was blind to Christ's identity! Christ was a stumbling block to the nation, but even the disciples - and we have seen this so graphically in previous weeks - even they had a problem with their spiritual sight, that they just could not see the true full identity of Jesus and what He was going, what He needed to do for the salvation of the world. I think the greatest significance of this story is to the disciples of our Lord, and I want to show you this by a comparison. Our last study, verse 35 of chapter 10 through to verse 45, was showing us the desire of James and John - and another gospel tells us their mother as well - to have the chief place with Christ in His kingdom when He would come to reign. But when you compare James and John and the disciples' attitude with Bartimaeus', it is revolutionary - because I believe they're connected by verse 51, where Jesus says the same question to blind Bartimaeus as He says to James and John in verse 36. In verse 51 He says to Bartimaeus, 'What do you want Me to do for you? '; and in verse 36 He says to James and John, 'What do you want Me to do for you?'. Now, when we compare James and John and Bartimaeus, we see such a difference, such a contrast in their characters in the face of the same question - Jesus asking 'What do you want Me to do for you?'. If we look in verse 37 we see that James and John's question was a request for selfish glory, in verse 37, 'They said to Him, 'Grant us that we may sit, one on Your right hand and the other on Your left, in Your glory''. Yet Bartimaeus, as we see in verse 47, his request was one for mercy: 'Son of David', he cried out, 'Have mercy on me'. We see that the motivation of James and John was that of pride, but the motivation, obviously, of Bartimaeus was that of brokenness. We see the attitude of James and John was a sense of a worthy right - they believed they had a right to the position beside Christ in His coming kingdom - and yet the attitude of Bartimaeus was the antithesis of that, a sense of his desperate need that only Jesus Christ could meet. Come with me to verse 48 and see something else. It says that many warned Bartimaeus to be quiet. Luke says that it was the crowd in front of him, probably going to the Passover feast, and they rebuked him: 'Be quiet!'. Now, if you turn to verse 41 you will see that the ten disciples were similarly indignant with James and John for asking this question that they wanted Jesus to do whatever they asked, and they were asking to sit on the right hand and the other on His left in His glory. I think the reason for that was that the ten were probably annoyed because James and John had beat them to that question, because they felt, the ten felt worthy of the position of glory themselves! So the ten were indignant at James and John for the question, and now look in this account of Bartimaeus - the crowd, and we don't know if the disciples are included among them, the crowd silenced Bartimaeus because they felt Bartimaeus was unworthy. Do you see this? The disciples were indignant with James and John because they thought themselves worthy, and yet the crowd - whether the disciples were included or not in this Bartimaeus account - they were indignant and angry at Bartimaeus because they felt he was unworthy! Now if you look at verse 13, we see more indignation - but this time the indignation is on the part of the disciples and the Lord Jesus. Verse 13: 'Then they brought little children to Him, that He might touch them; but the disciples rebuked those who brought them' - isn't that interesting? - 'but when Jesus saw it, He was greatly displeased', some translations put it 'indignant', 'and said to them, 'Let the little children come to Me, and do not forbid them; for of such is the kingdom of God''. Do you see what Jesus gets annoyed about? What Jesus gets angry, we would even say 'indignant', about? Very interesting, isn't it? The crowd were indignant and angry at Bartimaeus because they felt he was unworthy! Now I believe with all my heart - if you believe the Bible, you must believe this - that this was a literal healing of blind eyes that were made to see, but the miracles often were parables in action. This is illustrating truth for us, and I believe this healing of Bartimaeus is an illustration of verse 31 of chapter 10: 'But many who are first will be last, and the last first'. If it's an illustration of verse 31, it's also an example of verses 43 through to 45, what the Lord was teaching His own servants about true greatness: 'Yet it shall not be so among you; but whoever desires to become great among you shall be your servant. And whoever of you desires to be first shall be slave of all. For even the Son of Man did not come to be served, but to serve, and to give His life a ransom for many'. The lesson to the disciples was simply this: in verse 35 they demanded of Jesus, 'Teacher, we want You to do for us whatever we ask', and yet Jesus called Bartimaeus. The disciples were driven by pride, in a sense, of the worthy right that they should sit at either side of the Lord Jesus; and the other disciples were driven by an annoyance that they might have missed the boat as far as that was concerned, because James and John got in first - but no, Bartimaeus cried out, realising how despised and how broken he was, and looking for mercy; and it was Bartimaeus that Jesus called. Do you know what the great lesson in this is - not only for the disciples but for us all? Jesus is teaching us that brokenness is the fast track to Himself. Do you realise that? Brokenness is the fast track to Jesus. When we break something, whatever it is, crockery or our computers or mobile phones, we dispose of them, we discard them - but God uses broken things, broken men with broken hearts. He uses the earthen vessel, so that the glory of the treasure within will shine forth. The Bible says: 'A broken and a contrite heart, God will not despise'. James says: 'God resists the proud, but gives grace to the humble' - that means the Almighty, Omnipotent God of creation, He resists the proud but He can't resist the humble. There's a great secret in this: if you want to be near to God, brokenness is one of the keys. God is nearest to those of a broken heart. Isaiah 57 verse 15 says: 'For thus says the high and lofty One who inhabits eternity, whose name is Holy; I dwell in the high and holy place, with him who has a contrite and humble spirit, to revive the spirit of the humble, and to revive the heart of the contrite one'. God dwells with the broken. Now the disciples asked the question 'We want You to do whatever we ask', and Jesus responded, 'What do you want Me to do for you?' - the same question He responded to Bartimaeus' question with, 'What do you want Me to do for you?'. But the difference was: Bartimaeus knew he was blind and needed sight, but the disciples were blind and couldn't see it! That's it! I'm convinced that these two accounts are connected in this regard - but additional to that, which reinforces this conviction in my mind, is the fact that this is the second of two healings of blind men recorded in Mark's gospel. Blind Bartimaeus we've just read about, but if you come back with me to Mark chapter 8, we read there in verse 22: 'Then He came to Bethsaida; and they brought a blind man to Him, and begged Him to touch him. So He took the blind man by the hand and led him out of the town. And when He had spit on his eyes and put His hands on him, He asked him if he saw anything. And he looked up and said, 'I see men like trees, walking'. Then He put His hands on his eyes again and made him look up. And he was restored and saw everything clearly. Then He sent him away to his house, saying, 'Neither go into the town, nor tell anyone in the town'. The difference was: Bartimaeus knew he was blind and needed sight, but the disciples were blind and couldn't see it! Now when I preached on that about ten lessons ago in this series, I entitled it 'Blindness in Degrees' - and that's exactly what this passage in chapter 8 is all about. The context is, at the beginning of the chapter, the feeding of the 4000, and the disciples still could not understand the lessons that the Lord was teaching them through the feeding of the 4000 and the feeding of the 5000 - that being, His identity as the Bread of Heaven among them, as the great Jehovah who could provide; and His sufficiency, that they don't need to run to shops, even though they're closed at night, for bread, that He can supply whatever they needed. We see that very clearly in chapter 8, in verse 17 Jesus says: ''Why do you reason because you have no bread? Do you not yet perceive nor understand? Is your heart still hardened? Having eyes, do you not see? And having ears, do you not hear? And do you not remember? When I broke the five loaves for the five thousand, how many baskets full of fragments did you take up?' They said to Him, 'Twelve'. 'Also, when I broke the seven for the four thousand, how many large baskets full of fragments did you take up?' And they said, 'Seven'. So He said to them, 'How is it you do not understand?''. All these verses in chapter 8 are about blindness, blindness in different degrees. Now, the failure to perceive these great truths of the identity and sufficiency of Christ was first among the Pharisees - they were the most blind, weren't they? They were wilfully blind from the hardness of their hearts. But the second group in this chapter that are blind are the disciples, with an ignorant blindness because of the dullness of their hearts. Now, they were not as blind as the Pharisees, but there still wasn't enough light getting in. In order to illustrate that condition of the disciples, the Lord Jesus performs a partial miracle, and then straight after it a complete healing of this blind man. Now this is a unique miracle in the whole of the life and ministry of the Lord Jesus that we have revealed to us, and there's got to be a reason for that. We've seen very clearly, I believe, in our study in the past, and now again it comes afresh to us, that this partial healing was an illustration again to these disciples: 'You're missing the obvious, you're slow to learn, you're blind to what I'm trying to teach you'. What a lesson there is for all of us in that! So often we miss, we are blind to, we are slow to learn what the Lord would have us see clearly. So the Lord partially heals this man - not because He ran out of power, but because He had a lesson to teach! In verse 24 we see the man being healed testified: 'I see men like trees, walking'. 'Disciples', Jesus is saying, 'you're dull. Your knowledge of Me, My identity, My sufficiency, it's only partial - it needs to be completed'. You see, the disciples only dimly grasped the true purpose even of His mission, and we've seen this so often in Mark's gospel, this enigma to their minds of how the great Messiah who was promised in the Old Testament should suffer and die - they couldn't take it in! You see in chapter 8 verses 31 to 33, He's again predicting it, and it's Peter who comes and openly rebukes Him! He can't take it, and even less can the rest of the disciples take the teaching that He goes into from talking about His cross, then in verses 34 through to 38 talking about their cross - that there is a cost, and it's the cross, and the way of the cross is the way to glory, the way of the cross is the way to the crown, and there can't be any gain without the pain of the cross. We need to learn that, because we who want to know Christ and follow Christ, and truly be His disciples, we need to learn what Paul said: 'That I may know Him', we want that, 'and the power of His resurrection', we want that, but he goes on to say 'that I may know Him and the power of His resurrection, and the fellowship of His sufferings, being conformed to His death'. These disciples just couldn't get it, and that's the context of this blind man's healing in chapter 8 of Mark, and I believe it's a similar context now in Mark chapter 10. The disciples are still blind, even as the Lord Jesus goes to the cross, 15 miles away from Jerusalem, and this is the last miracle He is to perform, and it's one of blindness. Isn't it very interesting that it's not until after the resurrection that the disciples' eyes are opened about the whole plan of the cross and resurrection. He urges the two on the Road to Emmaus, Luke 24: 'O foolish ones, and slow of heart to believe in all that the prophets have spoken! Ought not the Christ to have suffered these things and to enter into His glory?'. But Bartimaeus, though he was literally blind, had inner eyes to see - and he calls Jesus: 'Rabboni', that is a beautiful word. 'Rabboni' means 'Master', 'My Master'. 'Rabboni, that I might receive my sight' - now, the only other person in the Gospels who used the name 'Rabboni' for Jesus was Mary Magdalene who once possessed seven demons. You understand the preciousness that Jesus held in her heart for her great deliverance and emancipation, and here we have this blind man - and yes, he twice called the Lord 'Son of David', a national messianic title, he understood who He was, the theology of it all - but see the tenderness where he says 'Rabboni', that was an expression of faith. Faith! Rabboni! We know it was faith because the Lord Jesus said to him in verse 52: 'Go your way; your faith has made you well' - your faith, literally, has saved you - your faith has saved you! Immediately he received his sight and followed Jesus on the road. You see, Bartimaeus had faith, and he must have heard about the Lord Jesus in His healing miracles, perhaps miracles of giving blind eyes sight - and Romans 10:17 teaches us that faith comes by hearing, and hearing by the word of God, 'The just shall live by his faith'. We begin in the Christian life by faith, but we continue by faith - to believe is to see, and to believe is to see the unseen truths of the kingdom of God. Without faith it is impossible to please God, and faith is the evidence, the substance of things not seen, things hoped for. Here was a blind begging Jew who could see farther even than the disciples of the Lord Jesus Christ! Someone once bluntly asked blind and deaf Helen Keller: 'Isn't it terrible to be blind? ', to which she responded, 'Better to be blind and see with your heart, than to have two good eyes and see nothing'. Better to be blind and see with your heart, than to have two good eyes and see nothing. She said on another occasion: 'The only thing worse than being blind is having sight but no vision'. Through faith in Christ, having heard the word of God and the testimony of Jesus, this blind beggar received his sight and was saved. The first sight he saw was Jesus, and I believe he never took his eyes off Him because we read: 'He followed Jesus'. Immediately, having received his sight, he followed Jesus - do you know what that means? He followed Him into Jerusalem, he followed Him to the cross, he witnessed the triumphal entry that we will look at in our next study on Palm Sunday - but then he went all the way to Calvary and he witnessed the horror of the crucifixion. I'm sure that he witnessed the message of the resurrection, and maybe even the resurrected Lord Himself. Talk about getting your eyes opened! I hope your eyes are open to the gospel lessons in this portion of Scripture. If you're a sinner, the pitiful, blind and beggarly condition that you have - but, oh, that your eyes would be opened to the great opportunity as Jesus has come to us in the gospel, as He has passed by our way; and by His Spirit and through His word now as He's passing by you, that you will not miss Him, but you will cry out earnestly, like blind Bartimaeus, knowing who Jesus is, determined to cry out no matter who shouts against you and rebukes you, crying for mercy. Personally saying: 'Lord, be merciful to me' - that your eyes would be opened to see that the Lord will instantly respond to your repentance and faith. He will stop, He will call you, He will hear you, and He will heal you - and you will miraculously be transformed and receive your sight! But believers, we need to have true spiritual vision, and we need to see that brokenness is the fast track to Jesus. We need to beware that our requests that we make of God are not motivated by selfish glory like James and John's were, but by mercy, by the need of mercy that Bartimaeus felt. We need to make sure that our motive is not pride, but brokenness, realising our need; that our attitude is not a sense of worthy right - though we have many rights, they are all in Christ, not in our own worthiness - and that we express constantly to God a sense of our desperate need, that brokenness is the fast track to Jesus. If we want to know true abiding with God and communion with God, we will have to know true brokenness. So often we miss, are blind to, and slow to learn what the Lord would have us see clearly. I wonder what the Lord has been trying to get you to see lately? I know what He's been trying to get me to see, and I'm slow to learn, I'm blind to see clearly. O, may we come to the Lord afresh just now, just like Bartimaeus, and with a tenderness that is expressed in that term 'Rabboni', come to Him in faith, that our faith may make us whole, we may see as we ought to see and truly follow Christ, hearing His voice. If we follow Him, like Bartimaeus, we will enter into such sweet communion, and indeed such revelations of Christ - His cross, His resurrection, His triumph, His glory and His power that can truly be described as an eye-opener. May God bless His word to our hearts. Let us pray: Rabboni, my Master, open my eyes to see myself as You see me. Open my eyes to see Yourself as You are, and the cross as it was and as it is in my life, and is to be daily in my life. Lord, help us all to know what it is to have true brokenness before You, that Your mighty life would inflow us and outflow to others to the glory of God in sacrificial service through the power of the cross. For we ask these things because, Rabboni, You have died and risen again, and are our Saviour and our Lord. Amen. 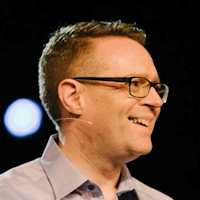 This sermon was delivered in Portadown, Northern Ireland, by David Legge. It was transcribed from the forty-eighth recording in his 'Studies In Mark' series, entitled "A Real Eye-Opener" - Transcribed by Andrew Watkins, Preach The Word.